Though we were only in Perth for two weeks, we saw a lot of wonderful places. 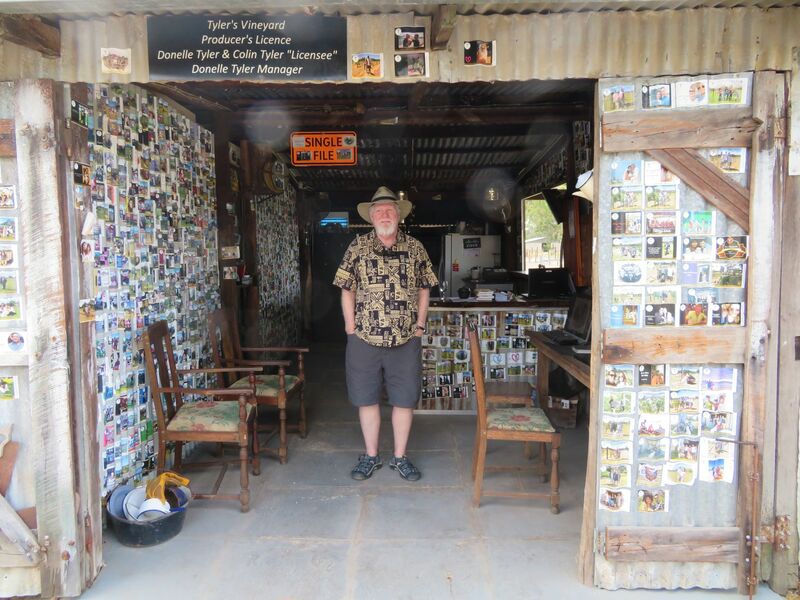 It would be easy to spend six months traveling from the far south corner of Australia around Albany, moving along the coast until you reached Darwin. That’s about 5000 km, and part of the reason that we didn’t see more of Western Australia than we did. This is a really, really big place. Here are a few thoughts about our visit. AirBnB: We stayed in Yanchep, north of Perth, in a house that overlooks the ocean. There is a drop to the beach of 5-10 m so we looked out over the water, not on the breaking waves, but we could hear them. Our house was comfortable and well furnished for a good-sized group. We had more than enough dishes, linens, etc. The TV was simple to work. Attractions: We liked a number of tourist attractions that we might not have visited without the initiative of Lyra during her visit. 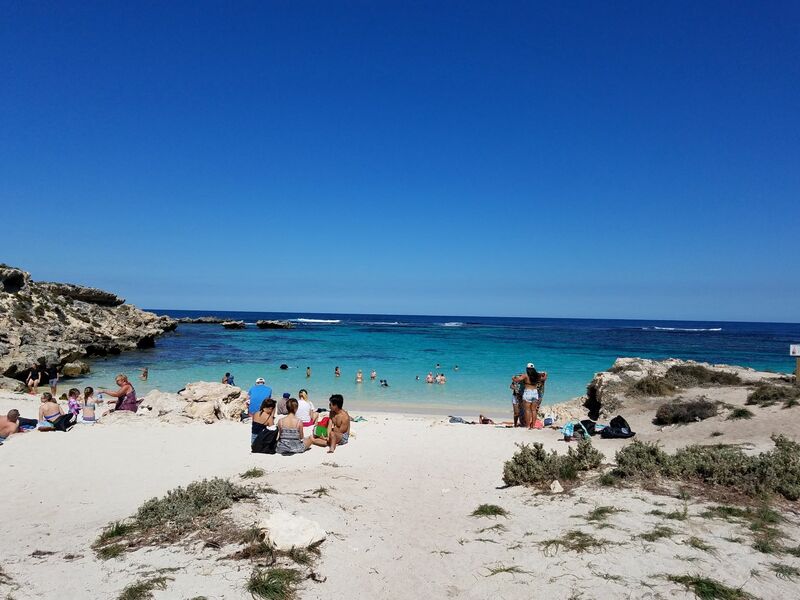 Guidebooks all recommend a visit to Rottnest Island, and now we do, too. It is a lovely vacation spot, with beaches for swimming and snorkeling around every corner. There are miles and miles of beaches along the coast, too, and lots have rocky reefs for snorkeling. Rent a bicycle, or ride the hop on-hop off bus like we did. 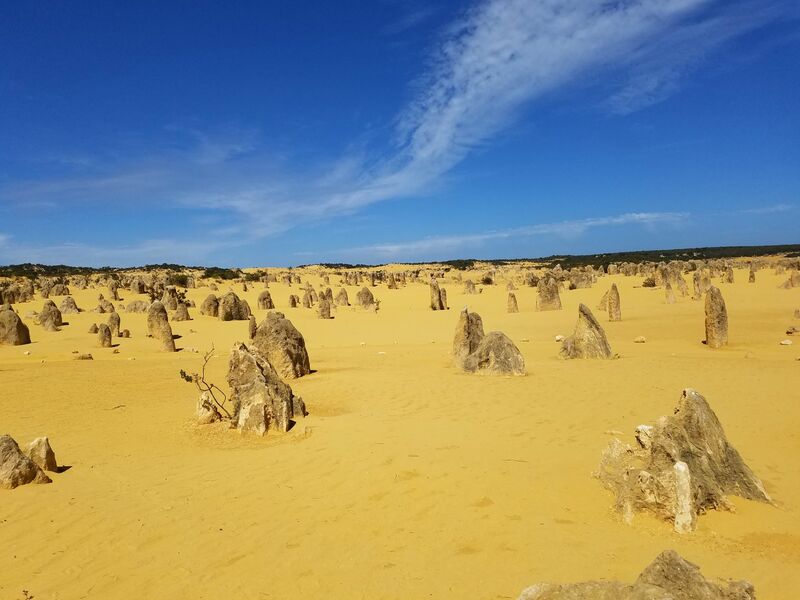 The Pinnacles, near Cervantes, is a geological marvel. If your group is young, stop to sand board at Lancelin on the way. I was skeptical of the Yanchep Crystal Caves, which turned out to be impressive caves with an interesting story. Fremantle Markets is a touristy area, but fun, with lots to look at. We saw a comedy revue, Senior Moments, at the Heath Ledger theater at the State Theater Center. It was lots of fun–the Theater Center has a busy program. Perth Botanical Garden and King’s Park is particularly nice to walk in. There are lots of paths, some raised so you don’t need to think about snakes. There are beautiful views over downtown Perth. Yanchep National Park is home to a large flock of Carnaby’s cockatoos, an endangered species. We saw lots and lots of them near the Visitor’s Center! We went on an outing with Bird Life Western Australia, and had a lovely time. Everyone was friendly and we saw interesting birds at Tomato Lake. Driving: Roads are generally good in this area. Despite the distance (about an hour’s drive), we went in to Perth and Fremantle several times. The traffic was slow during rush hour, but it was easy to find parking in the city. The cost ranged from free to about $5.50 an hour. We saw signs announcing speed cameras, but we won’t know for about three months whether we got any speeding tickets. It doesn’t seem likely, but that’s what we thought in other places. There are no toll roads in this area. Shopping: We found the best place to shop thus far in Australia, Mokoh Designs. They make interesting items with humorous Australian themes. We liked everything they sell. We recommend Perth to everyone! As is often the case, we meant to go much farther afield. We intended to go to Margaret River, but it is a 3 1/2 hour drive each way. 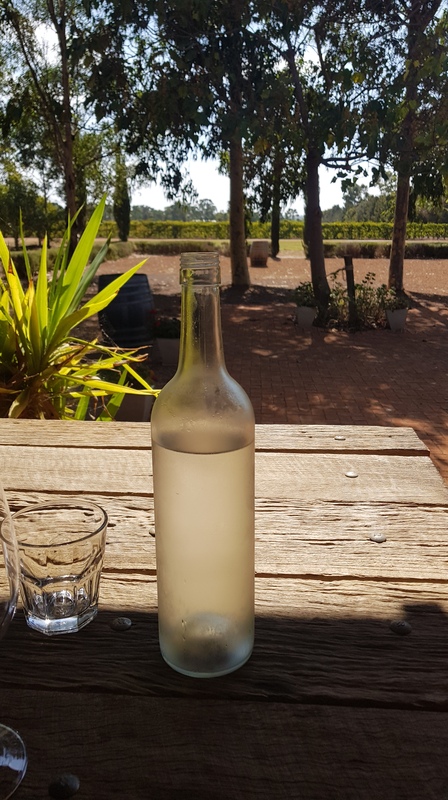 Even staying overnight there would be a lot of driving, so we decided to taste wine closer to home, just outside Perth in the Swan River Valley. There is a readily available map (online and paper) that shows many of the vineyards, restaurants, and other stops in the area that extends from just NW of the Perth Airport northward through towns like Midland, Henley Brook, and Brigadoon. 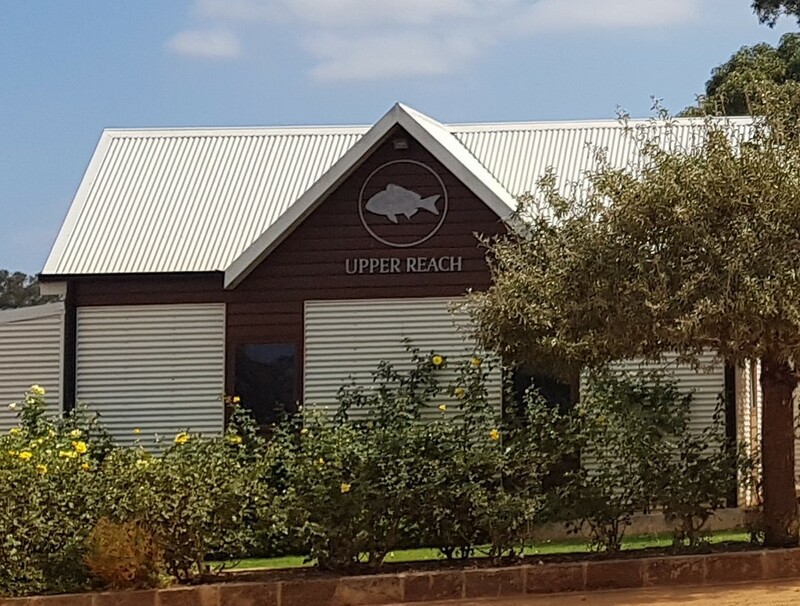 Coming from Yanchep, we drove north to south, and after a brief stop and taste at John Kosovich winery, we stopped at Upper Reach. We chatted with Steve, who steered us to the rest of our day’s stops. We were only buying one bottle (we’re leaving shortly), and Upper Reach was only our second stop, so we put off a purchase. Armed with Steve’s suggestions and a bottle of wine to deliver to Tyler’s Vineyard for him, we went on to Faber Vineyard. I planned to taste their Verdelho, as Upper Reach was sold out of theirs, but we found that Faber had just sold out their 2018 Verdelho the previous day. New releases don’t start until August, and Swan Valley Verdelho appears to have plenty of fans. Rather than standing at the bar, Faber invites visitors to sit at tables facing a nicely landscaped area. We both spit out most of the wine we taste, and we share a single glass to keep our tasting sips small, but you can still feel the alcohol after a while. We’ve found Australian vineyards generous in the range of wines offered. Each vineyard offers six to ten different wines for tasting. Even declining the sweet wines and most of the fortified wines, there is a lot to taste. Swan River whites are generally good, and the range of reds is enormous, definitely something for everyone. From Faber we went to the most entertaining of our stops, Tyler’s Vineyard. We delivered the bottle from Steve, well-received as you can imagine. Tyler’s produces only grenache in a variety of forms, but they have a great gimmick. With the purchase of any bottle, you can get your photo taken and make your own label. In addition to what goes on the bottle(s), an extra label is produced that can be pasted on the walls of the tiny cellar door shed. The walls are covered with labels. You can see the celebration of anniversaries from first year to 60 years, marriage proposals, and lots of birthdays. While we were there, a couple was buying wine and making a label for his birthday. We had a nice chat, got a recommendation to her sister’s Barossa tasting room in Hahndorf (near Adelaide), and chatted about travel. It was great fun to see the process, especially since we didn’t need any wine ourselves. Making our way to four vineyards is more than our usual tasting tour, and our next stop had to be lunch. We followed Steve’s recommendation and stopped at Mandoon Estate. This is a larger operation than the others we visited. The bistro was packed, there were picnickers on lawn, kids playing on the jungle gym, we even watched the six young men of a wedding party sipping wine as they waited for their event to start. Our lunch was delicious–we went all out for a quiet lunch in the fine dining section. I finally had my glass of Swan Valley Verdelho along with my quail terrine and sous vide chicken. Jonathan had a glass of red with his carpaccio followed by pork belly. 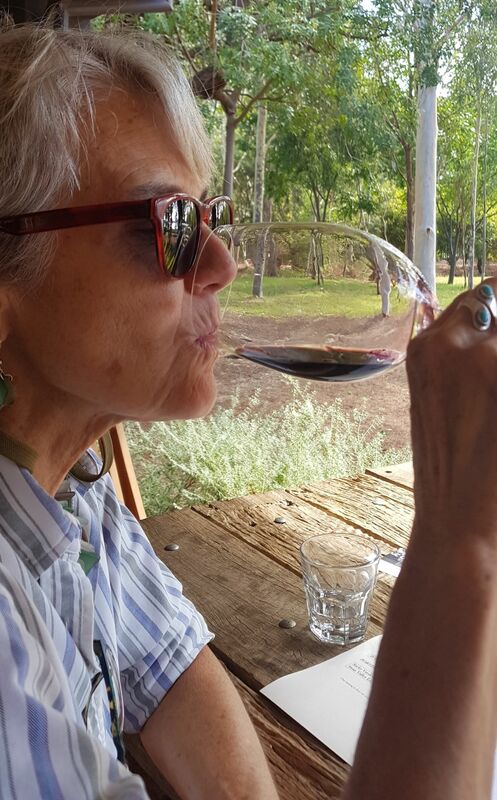 After a long pause over our lunch, we headed home by way of Upper Reach, where we bought the bottle of Black Bream red (Cab-Merlot blend) that was so delicious when we first tasted it in the morning. We thanked Steve for his excellent suggestions and headed for home, pleased with our tasting tour and ready to recommend the Swan Valley to anyone. We jumped into action to take advantage of Lyra’s last week with us. After arriving at our temporary home in Yanchep around midnight, we slept in before going to Yanchep Beach just below our house. The water is deep turquoise blue, and the Indian Ocean stretches to the horizon. Beyond Yanchep to the north are the Lancelin dunes, where there is sandboarding for the adventurous. The dramatic formation called “The Pinnacles” is nearby. I missed this as I had a cold and refused to move for a day. I may now insist on visiting. The sand is bright yellow and the rocks stick right up out of it. There’s a remarkable contrast against a blue sky. They picked the right day to visit. From bright sun, we went into a deep cave, visiting the Yanchep Crystal Caves. A formation of limestone over sand and seawater resulted in the formation of extensive caves that were discovered in the late 19th century. Full of needle-like stalactites and rippling flowstone, one of the chambers is so large it was used for parties. Called Cabaret Cave, it can still be booked for meetings and events. We saw the wedding in the park that was going to have a reception in the cave. Unfortunately, the use of ground water to supply Perth has lowered the water table a great deal and the cave is now completely dry, meaning no new stalactites are forming. It is also getting warmer and no one knows what may result. The park is gradually creating artificial pools of water within the cave to try and keep it cool and moist. The docent guiding our tour was a passionate caver and water conservation supporter. She tries to make people aware of the inherent conflict between the need for drinking water and the destruction of caves and underground life. 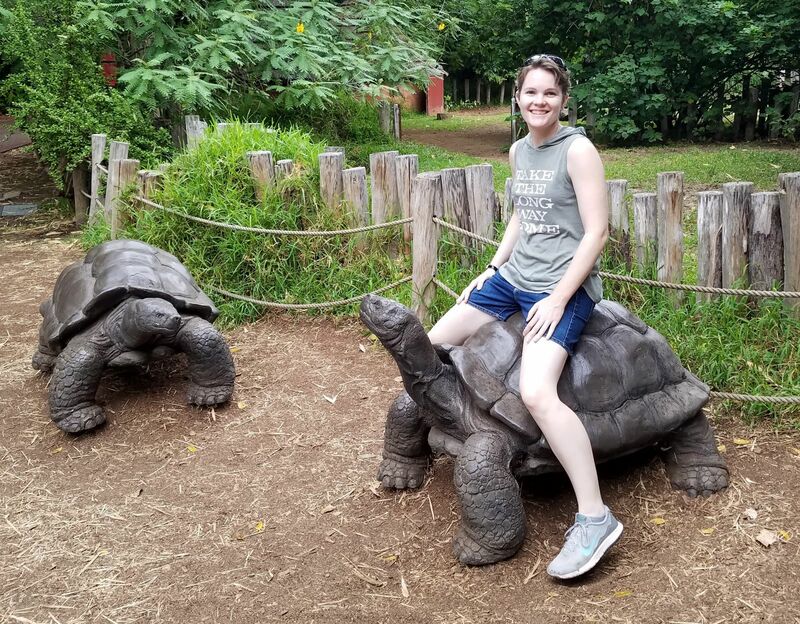 We also met up with our friend Michele from our Galapagos trip. She is a docent at Perth Zoo and fixed us up with a giraffe encounter. They are really BIG, their tongues are really LONG and BLUE. They are very good at pulling a branch out of your hand. Next we went to sea, taking the ferry to Rottnest Island, a 30 minute ride offshore. 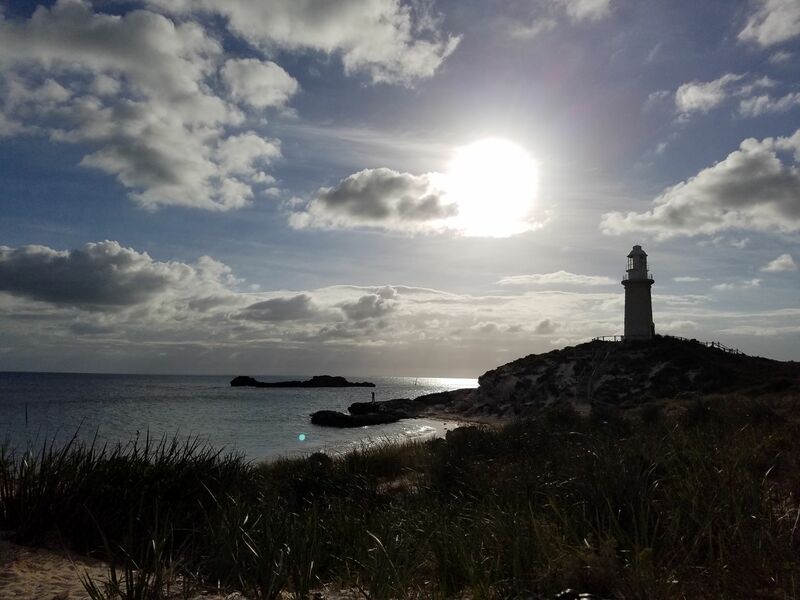 Every person we met who knew we were visiting Perth suggested a visit to Rottnest, and our decision to stay overnight was a good one. You can walk, bike, or ride the bus around the island. Lyra took a bike and we rode the bus to Little Salmon Bay. It looks like the Caribbean. From there, we moved on to Strickland Bay, much rockier, but with better beach combing. We met a woman taking her SUP (Stand-up Paddleboard) out to practice for a competition coming up the next weekend. The water was full of surfers. You could easily stay a week, snorkeling at different beaches, biking, fishing, and lounging by the pool. Lyra took a dip in the late afternoon when the Welcome swallows were stopping to sip the water. 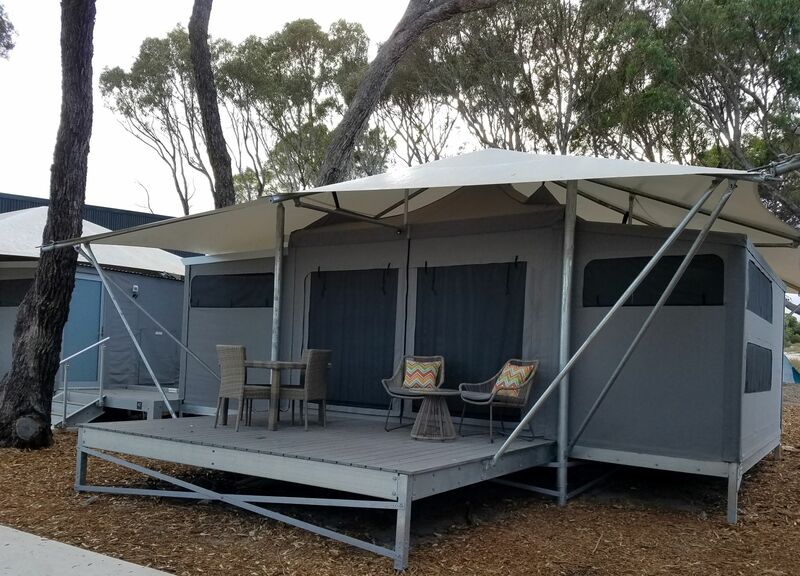 Rottnest was our first “glamping” experience. There’s nothing wrong with a tent when it has it’s own ensuite bathroom. The Discovery Eco-resort has only been open for a month, and that means the tents are brand new. No critters hiding in the corners, though they remind you to keep your tent zipped so that a curious marsupial doesn’t decide to visit. That’s quite likely, as quokkas live on the island and are well protected. They are not afraid of people, though they don’t tolerate being touched or picked up. One quokka wanted to sit beside Lyra’s feet at dinner. Others kept us company at the bus stop. They don’t beg, they just sit. Everyone who visits the island takes a quokka selfie. We sailed back to the mainland with plenty of quokka photos and sea views. The Fremantle Markets were another stop on our tour of the region. 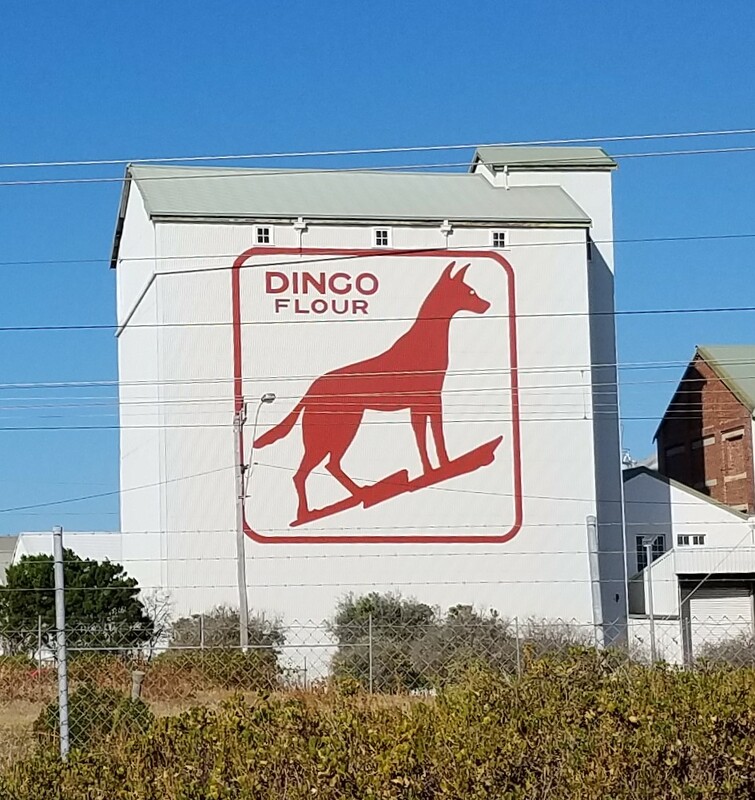 On our way there we passed the Dingo Flour sign, the icon of Fremantle. The markets were full of tourist items, bars, restaurants, and food stalls. We also passed a koala on its way to a public appearance–the most awake koala I’ve ever seen. There’s something weird about seeing a koala carried like a little kid. We went for one last walk along the Indian Ocean, then Lyra packed up and headed for LA. Many hours later she was there, though it was still the same day she left Perth.